The versatile and easy-to-use retractable awning can be a great option. With all the shade structure and style options available to you, finding the right awning for your home can be overwhelming. But whether you want to enjoy the sunlight, protect your patio or windows from harsh weather, or shade your garden or deck, the versatile and easy-to-use retractable awning can be a great option. These can be easily opened and closed to use as needed, and come in a variety of sizes, shapes, and shade styles. You can always find the perfect retractable awning for you. Here are just four benefits of choosing retractable awnings. Retractable awnings are very easy to take care of. Taking these shade structures down in the winter for annual care is a breeze–just retract and remove the shade! Be sure to take the awning down during harsh weather events. Store the shade itself in a dry place to prevent damage related to rain, ice, and heavy snow buildup. With simple maintenance, your shade structure will look great for years. While you’ll want to be sure to give your retractable awning particular care during the harsher winter months, the weather can be less predictable through the rest of the year. Luckily, retractable awnings are very versatile. You can easily retract your awning in the case of more severe weather, or pull it out after a rain to enjoy your patio in the shade! Plus, with all the sizes, strengths, and styles available to you, you’ll be able to find the perfect shade structure to meet your unique needs. 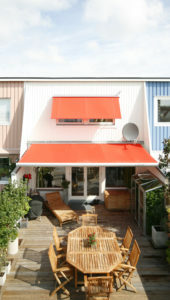 Retractable awnings can make it easy to shade your outdoor space or enjoy the warm sun! They also allow you to easily protect your patio, furniture, windows, and doors from inclement weather. With a retractable awning, you don’t need to take all your outdoor furniture inside during a rainy afternoon. Simply pull your awning out to continue enjoying your outdoor space. Between the fabric types, colors, styles, and more available to you with retractable awnings, you’re sure to find the perfect design for your outdoor space. Retractable awnings can be outfitted to meet your design needs. These highly customizable shade structures are a no-brainer!